Digital media, including videos, music, and photos, is everywhere. Storing all this media on your PC or Mac is no problem, but what about tablets and smartphones? Many people have more media than their mobile devices can hold. 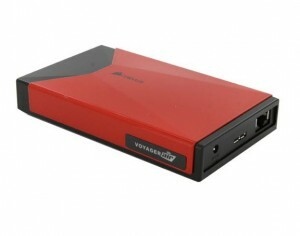 Corsair designed Voyager Air to be the perfect storage device for this new, mobile world. Voyager Air is an all-in-one network drive (Network Attached Storage), portable wireless drive, USB drive, and wireless hub that lets you consolidate all your digital media, and enjoy it anytime and anywhere. Voyager Air was designed to be useful at home – an environment where other wireless drives often fall short. With a high-speed Gigabit Ethernet port, the Voyager Air plugs into your home router, and works as shared network storage for all your desktop and notebook computers. With Voyager Air on your home network, it’s easy to consolidate and share digital media. Voyager Air was also designed for mobility. The drive has a high-capacity rechargeable battery and built-in Wi-Fi, so it’s easy to take with you anywhere you go. Just connect to it from your tablet or smartphone as you would connect to a wireless network, and then use the free Voyager Air app to access the drive. The battery provides up to seven hours of video streaming, and it’s easy to recharge via AC, USB, or the included 2A car adapter. As multi-user drive, Voyager Air is capable of streaming different HD video on up to five devices at the same time. If you’re in an area with public Wi-Fi, like a coffee shop or hotel, you can configure it using Wi-Fi Passthru to act as a wireless hub, providing Internet access to all your devices. Connect it directly to a PC or Mac with the included USB cable and it works just like any other portable drive. It works with Windows by default, and can be easily reformatted for Mac compatibility. Voyager Air works with Windows 8, Windows 7, Windows Vista, Windows XP, Mac OS 9, and Mac OS X. The iOS mobile app is compatible with iOS 5.1 and higher. And the Android app works on tablets and smartphones running Android 2.3.3 and higher. About the Guest Author: Founded in 1994, Corsair supplies high performance products purchased primarily by PC gaming enthusiasts who build their own PCs or buy pre-assembled customized systems. The company’s award-winning products include DDR3 memory upgrades, mobile storage, power supply units, solid-state drives, PC speakers, gaming headsets, gaming keyboards, laser gaming mice, system monitoring and control devices, PC cooling products, and computer cases. a hub so useful because of its portability and its quality design.